Paid sick days allow employees to take time off from work while they are ill without losing pay. Employees accrue sick days based on their employers' policies. Some base the number on years of service and the level of their position within the company, and some allocate the same number to everybody. Some employers allow sick days to roll over from one year to the next, often capping at a certain number of days or hours, while others do not allow them to accumulate. Historically, sick days have been a common perk employers voluntarily provided. There is no federal law requiring employers to offer paid sick leave, but as of 2018, 10 states and the District of Columbia require employers to provide some form of paid time off for employees who are sick. Paid sick leave is part of the benefits package for 85 percent of full-time workers and 74 percent of all U.S. workers, according to a March 2018 survey by the U.S. Bureau of Labor Statistics. Full-time workers in state and local government had access to paid sick days in 99 percent of jobs. Among all jobs, union employees received paid sick leave 90 percent of the time, while the number was 71 percent for nonunion employees. Part-time employees receive paid sick leave in only 40 percent of jobs, and service industry employees, at 56 percent, are the least likely to receive paid sick leave. In most full-time positions, employees simply expect that some form of paid sick leave will be part of the benefits package. While paid sick days generally are viewed as an employee benefit, they are beneficial to employers as well. 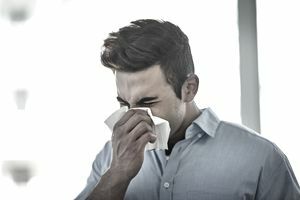 Paying an employee to stay home sick may not seem like it's good for the bottom line, but if that employee is contagious and comes into work, there is a risk that numerous employees could become sick, hurting the bottom line even more. With paid sick leave, employees can be more comfortable with the prospect of staying home when sick, knowing they aren't losing a day's pay. Hopefully, this helps limit the number of contagious employees in the workplace, reducing the total number of work days lost to illness. There are no federal laws in the United States that require an employer to offer paid sick days as a benefit, but states and other local municipalities can enact such ordinances and laws. In 2006, San Francisco became the first city in the U.S. to mandate employers to provide paid sick days, and Connecticut became the first state to do so in 2011. California's law, enacted in 2015, requires employees to earn at least one hour of paid leave for every 30 hours worked. Accrual began on the first day of employment or July 1, 2015. As of 2018, other states to require paid sick leave include Arizona, Maryland, Massachusetts, New Jersey, Oregon, Rhode Island, Vermont, and Washington. Most organizations use a formula that assigns a certain number of sick day hours accrued during each pay period. Other employers make the paid sick days available at the beginning of a calendar year—although that is an option that may increase the risk for employers. For example, if an employee uses all of his paid sick days in the first couple of months of the year, then quits, the employer has paid a year's worth of sick time to an employee who worked only a couple of months. Some employers opt for a paid time off (PTO) policy that folds sick days, vacation days, and personal days into one bank of days that employees can use at their discretion. However, when employees have a bank of days, there is the risk that they will view all of the days as vacation time, failing to keep sick employees out of the workplace. What Is Employee Sick Leave? Do You Know Your Responsibilities as an Employer Under the ADA?